But it doesn’t stop there. This is one long list of excuses. 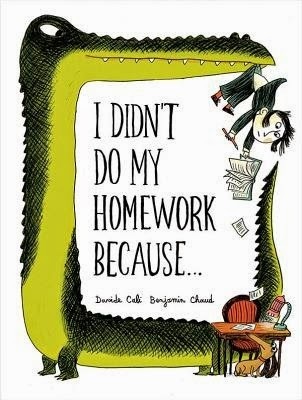 Excuses that are elaborate and imaginative in the extreme: elves, Vikings, UFOs, too much noise, Robin Hood, sacrificial workbooks, carnivorous plants, medicinal mayhem, and pencil-eating pet rabbits, are just some of the reasons this child’s homework wasn’t completed. They are certainly creative! Benjamin Chaud’s visualisation of Davide Cali’s excuses has created a wild and wacky world with lots of little details on each page. They complement each other perfectly, and this is a story bound to spark young imaginations into life, and probably set adults chuckling, too. The big question is of course, does the teacher believe any of the excuses? You’ll have to read right to the end to find out!